Amy Kritzer is the delightfully warm, sassy, sophisticated and lovable force behind the wildly popular Jewish food blog, What Jew Wanna Eat. 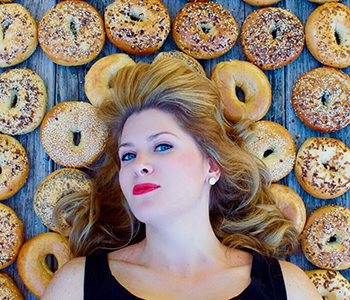 Check out both her blog and her Instagram feed to get a flavor of what the Austin, Texas-based writer and chef has cooking in her Jewish kitchen, from Beet Reubens and Potato Latke Pizza to Deep Fried Matzah Balls and Chili Lime and Avocado Matzah Ball Soup. You may initially do a double take at the introduction of, say, lime to such a classic as chicken soup, but remember Kritzer’s friendly homepage warning: This Ain’t Yo Bubbe’s Blog. And get ready for a smorgasbord of ridiculous but on-the-nose Jewish puns (Jew Year’s Eve, etc). Now, Kritzer’s quirky culinary personality is in print, focused squarely on the final, sweetest part of any meal. Sweet Noshings: New Twists on Traditional Jewish Desserts makes both an exceptionally tasty holiday gift and an inspired primer for anyone looking to spice up their Hanukkah dessert table. In the place of traditional jelly doughnuts, Kritzer suggests Chocolate-Lime Sufganiyot. 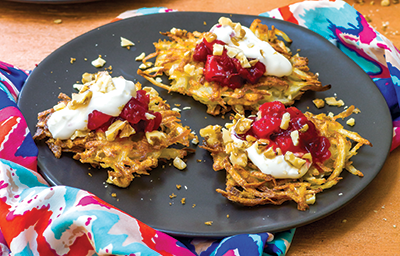 And her latkes are not of the dinner side-dish variety: Dessert Latkes with Fruit Compote and Marshmallow Sour Cream may be the most original version of the fried favorite you will ever make. As Kritzer might say in Austin, b’teyavon, y’all, and happy Hanukkah! I first started to see food on another level when I studied abroad in Barcelona my senior year of college. Now this may have been the sangria talking, but the best thing I discovered was warm churros, fried and dipped in a chocolate sauce. Their version had a hint of lime, and was my inspiration for these Hanukkah doughnuts. We eat fried foods on Hanukkah to commemorate how a little oil burned for eight full days when the Maccabees rededicated the Second Temple after their victory over the Syrian-Greeks. Combine yeast, warm milk, and 2 teaspoons sugar in a large bowl of a stand mixer and stir to dissolve. Wait 10 minutes, the mixture should get foamy. If it doesn’t the milk was probably too hot, too cold, or the yeast is dead. Try again! To the yeast mixture, add 3 1/4 cups flour and remaining sugar and stir to combine. Then add lime zest, and juice and stir to combine. Add eggs, one at a time, and mix with the dough hook until dough starts to come together. Then add salt and combine. With the mixer on low, add butter, a little at a time, until it’s incorporated into the dough. Then, mix on medium speed for about 5–10 minutes until dough is completely smooth and shiny. Make sure to scrape down the sides as you mix so everything gets incorporated. Knead dough on a floured surface until slightly tacky but no longer sticky, adding more flour if needed, about 5 minutes. Coat a large bowl with oil and place dough inside. Let rise in a warm place until doubled in size, about 2 hours. Meanwhile, make the chocolate-lime filling. Place egg yolks in a medium bowl and set aside. In a medium saucepan, whisk together sugar, cornstarch, cocoa powder, and salt. Then stir in milk. Heat over medium-low heat while stirring until thick, about 10 minutes. It takes a little while, so be patient! Remove from heat and whisk until you have a thick, smooth, pudding-like consistency. Then add chocolate, butter, and lime zest and stir until smooth. Add chocolate mixture to the eggs a little at a time so not to cook the raw eggs. Then put the mixture in the original saucepan and heat over medium-low heat just until warm to incorporate eggs. Strain if there are any little cooked egg pieces. Let cool and transfer to a pastry or plastic bag with a round tip. Refrigerate for 2 hours. When the dough is ready, punch it down and transfer to a lightly floured surface. Roll dough out to 3/4-inch thick and cut out doughnuts using a 3-inch round cutter. Roll out scraps to make more doughnuts. Place doughnuts on parchment paper–lined baking sheets about 1 inch apart. Cover loosely with plastic wrap and let rise in a warm place until they puff up, about 1 hour. At this point, you can refrigerate them for up to 2 hours if you’re not ready to fry them. Bring to room temperature before frying. When ready to fry, heat 2 inches of oil in a heavy-bottomed pot until it reaches 350ºF. Working in batches and being careful not to overcrowd the pan, fry the doughnuts. Flip them halfway through until both sides are golden brown, about 1-2 minutes per side. Let cool on cooling rack. When doughnuts are cool enough to touch, poke a hole in the top using the tip of the pastry bag. 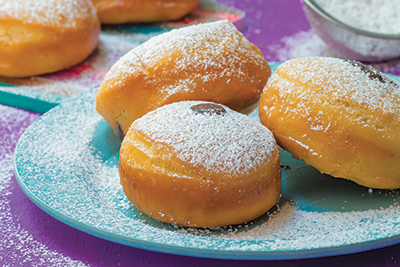 Fill with chocolate-lime filling until doughnut has some heft to it and garnish with powdered sugar. Eat! Hanukkah is all about the fried food. Luckily, the holiday occurs smack in the middle of winter, when a little more cushioning around the waist is welcome. These latkes are a testament to that. Latkes are fried grated potato cakes, sort of a Jewish hash brown. They are typically savory, but I created a sweet version with a super-simple marshmallow sour cream sauce, and a pear and cranberry compote instead of the traditional applesauce. I like sprinkling the sweet topping on post-fry so you can have a few plain latkes if you like. Plus, it keeps them extra crispy, which is exactly what we want. To make marshmallow sauce, whisk together marshmallow crème and sour cream until smooth. Refrigerate until ready to use. To make pear-cranberry compote, melt butter in a large saucepan over medium heat. Then add pears and sauté for 2-3 minutes until they start to soften. Add remaining ingredients, and simmer until cranberries pop and the mixture is thick, about 10-15 minutes. Cover to keep warm. In a separate small bowl, whisk together brown sugar, cinnamon, nutmeg, cayenne, and 1/2 teaspoon salt for the latke topping. Set aside. To make latkes, have a cooling rack nearby. Shred potatoes using the large holes of a hand grater into a bowl of ice water and let sit for 10 minutes. Remove the potatoes (you may need gloves since the water is very cold) and squeeze out any extra moisture (as much as possible) into the water bowl. Finish drying potatoes really, really well with a towel. Let water sit for 15 minutes to allow the starch to build up on the bottom of the bowl. Carefully drain water and reserve the milky white starch. You may have to scrape it off with a spoon. Dry the bowl very well. Return shredded potatoes to the large bowl. Then add in egg, reserved starch, flour or matzah meal, and salt and stir to combine. Heat a 1/4-inch layer of oil in a large sauté pan over medium heat. You’ll know the oil is ready if a small bit of latke batter sizzles when placed in oil. (You may have to add more oil as you fry; make sure to wait for it to heat back up.) Scoop 1/4-cup dollops of the latke mixture into oil and flatten slightly; fry until golden brown, about 2-3 minutes. Flip and fry on the other side. If your latkes aren’t holding together, try to add a little more flour and egg. Drain briefly on paper towels and place on cooling racks. Sprinkle with sugar mixture, and serve immediately with compote, marshmallow sour cream, and pecans. If not eating immediately, cover lightly with foil to keep warm or keep warm in a 200ºF oven. Love this, Libby! You captured me and Sweet Noshings so well!